One of my favorite ways to unwind throughout summer is to sit poolside with a good mystery and a stack of magazines. But I can’t quite escape the idea of summer reading lists. I always had one in high school and so each summer I make a list of books I should read – and want to read. It forces me to read outside my favorite genre. All the Light We Cannot See Anthony Doer’s novel has been on The New York Times bestseller list for a year. It’s about the lives of a blind French girl and a gadget-obsessed Germ boy before and during World War II. I’ve been on the waiting list at my library for a few months. I’m now 34th on the list. At one point I was 117 so I am making progress. So You’ve Been Publicly Shamed For the past three years, Jon Ronson has travelled the world meeting recipients of high-profile public shamings. The book is “a deeply honest book about modern life, full of eye-opening truths about the escalating war on human flaws – and the very scary part we all play in it.” I read a review of it and was intriqued by it. I don’t know if I will read it in its entirety, but I’m definitely going to heavily skim it. 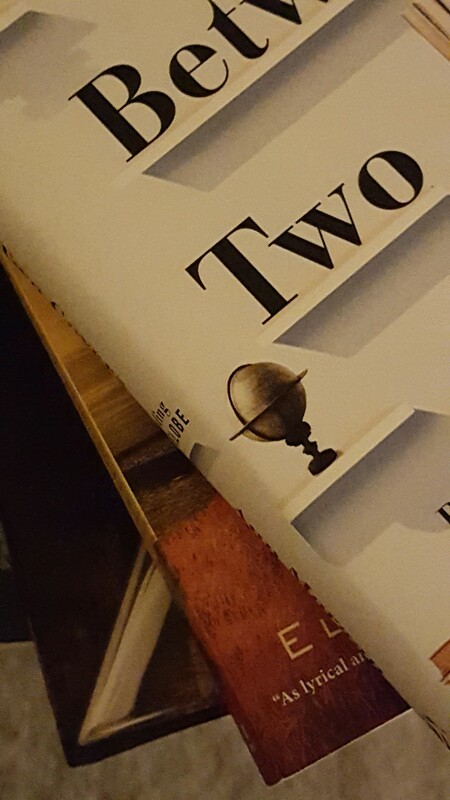 The World Between Two Covers A beguiling exploration of the joys of reading across boundaries, inspired by the author’s year-long journey through a book from every country. Ann Morgan writes in the opening, “I glanced up at my bookshelves… The awful truth dawned. I was a literary xenophobe.” The book “welcomes us into the global community of stories,” and I’m looking forward to exploring from my armchair. You will notice it’s shorter than in past years. It’s summertime, and I don’t want to be overly ambitious. Plus, too many of my favorite mystery writers have new books. I’ll see you at the pool. And if you have a suggestion for a book, please post it as a comment or share it with me on Twitter @PriceCynthia. One of the challenging parts of airport security is making sure you keep track of your personal items. You have to take off your shoes and jacket and place them in a bin. Your laptop needs to come out of the suitcase and into a bin. Your keys can’t be in your pocket. Your mobile goes into a bin, too. Once you clear the checkpoint, you have to put it all back together. It leaves one feeling discombobulated. 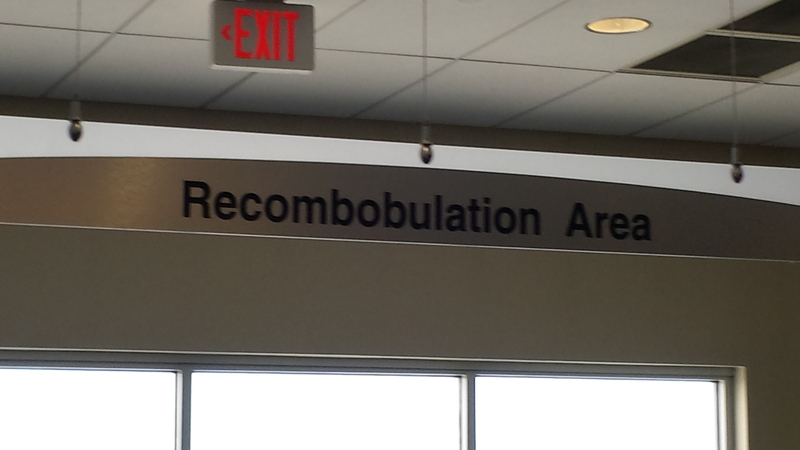 The Milwaukee airport features a Recombobulation Area (Photo by Cynthia Price). The sign hangs above the checkpoint. I saw it on a recent trip, and realized that I could use such a space at home and work. Soon after the trip, I created the spaces, which enable me to put order back into my life. At home I’ve designated a spot for my keys and work bag. Anything that needs to go to work, goes in the bag, which sits beside a foyer table. The table has room on top to set the mail that needs to be posted and the library books that need to be returned. A small bowl collects my keys. Everything in its place. I am now recombobulated and ready for work. The same holds true at work, where I have set aside a corner of my desk for work that needs to come home or articles I want to read at home. At day’s end, I know exactly what to grab. Often travel is hectic. But when a recombobulation area exists, suddenly travel – and life – seems less harried. The mystery writers group to which I belong (Sisters in Crime, Central Virginia chapter) received some great marketing advice from Rachel Thompson. She has 17 years of marketing experience and four books on Amazon. You can find her on Twitter @BadRedheadMedia. A lament of everyone on the call was that the marketing effort we put forward has to be effective because an author’s time needs to be spent writing. If you are on Twitter, use the appropriate hashtag. Choose one that is a term that people are likely to search on. For example, in our group, it would be #mystery. Often on social sharing sites, as authors we reach out to other authors. That’s fine, but Thompson said, “Really, we want to connect with readers and book bloggers.” In other words, we need to reach those who are going to read our books. Passively sell your books. To do this, change the header of your website or any of your social sites to show your books. You can take it a step further and include a link to where your books are sold. Create a schedule so you stay on top of sharing content. “In order to sell books, there has to be a consistent presence,” Thompson said. Brand the author, not the book. You will write many books, so it’s important to focus on you as an author and not on your latest book. This inchworm knew that if he kept moving forward he would reach his destination. 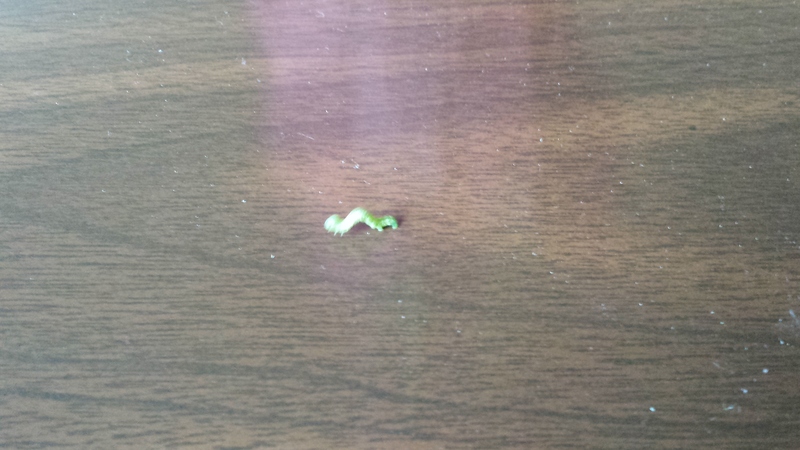 An inchworm landed on my conference table as I was meeting with a colleague. Despite its size, this inchworm was determined. My colleague and I became distracted from our agenda as we watched the inchworm make its way across the table. We even put an obstacle in its way to slow it down. This inchworm was too smart, and went around it. My colleague and I laughed and said the inchworm had some lessons to teach us. In exchange for the wisdom, we carefully carried it back outside. Lesson 1: It’s true that slow and steady will get you to your destination. The inchworm was determined to get to the other side of the table most likely thinking it was his ticket to the great outdoors. Given the distance and its size, it took the inchworm almost 20 minutes, but it made it. My colleague and I were working on a project plan. We knew we should not rush the plan but rather break it into small, manageable tasks to keep it moving forward. Lesson 2: Obstacles will appear, and it’s how you approach them that matters. For the inchworm, knocking the obstacle over was not an option. Calmly and deliberately going around it was. The same holds true in life. When an obstacle appears, how will you address it? There are always options. You need to choose the one that works for you. Lesson 3: Sometimes we all need some help. Despite all of its efforts, the inchworm was not going to make it back outside without some help. We gladly assisted. Don’t be afraid to ask a colleague or a friend for help when you need it. My colleague and I still chuckle over the distraction the inchworm provided us in our meeting. We won’t forget the lessons, however. In fact, there was one last one. Lesson 4: Sometimes it’s good to relax with a friend or a colleague and take a break. That’s exactly what we did as we watched the inchworm make its way across the table. Now that it is safely back outside, it’s time to return to my project list.